There's been some discussion about cast iron cookware lately, I just wanted to mention the alternative, cast aluminum, there are several companies making it, and several places selling it. The advantages to cast aluminum are that it cooks very much like cast iron, the seasoning process is the same, and the big thing is that it's light enough to carry in or on a backpack. The disadvantage to cast aluminum is the same as with all aluminum cookware, you can't cook reactive or acidic food in them such a tomatoes or tomato sauce, that's about it. I've got a cast aluminum dutch oven that's about seven inches in dia. that I pack once in a while when I'm planning on baking a bread or slow cooking baked beans, i bought it at sally's years ago and it's served me well. Are there any issues with heat conduction with cast aluminum? I know that I often burn things in regular aluminum outdoors cookwear because of the high conductivity. I do not seem to have problem with cats iron. Blackberry dumplings in cast aluminum. This cast aluminum thing has caught my interest. It would be neat to have a smaller aluminum dutch oven to take with. J.Townsend & Sons, Track of The Wolf, and Dixie Gun Works have all offered Cast aluminum dutch ovens, I think Panther Primitives is also carrying a line. Not any more than any other type of cookware or bake ware. The trick to not burning one's food is to know how to moderate the heat, cooking over flames will almost always end up with burnt food, the thicker the pan or skillet the longer it takes to heat it to cooking temps, once it reaches that temp either the heat source must be turned down, or the pan, skillet, or pot must be moved further away from the heat. 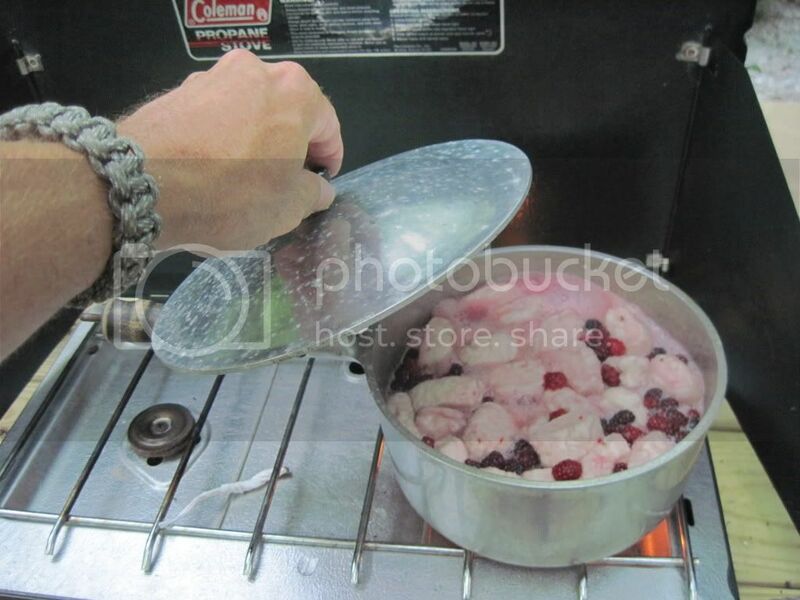 Most often I hear folks complain about the GI SS mess kits, or other thin metal cookware having burning or food sticking problems, and almost always it's because of too high a cooking temperature. Aluminum is a great heat conductor, but it also displaces heat quickly, so, unlike stainless, and especially unlike Cast cookware the center of the pan will be sizzling while the edges may be cool, but, the thicker the cookware the less heat it displaces, so while cast aluminum will heat up quicker the cast iron, and it will cool quicker than cast iron, the difference is marginal, both will turn out the same quality of food at approx. the same rate of temperature, it just take a little experimentation. And always try to cook with coals instead of open flames.